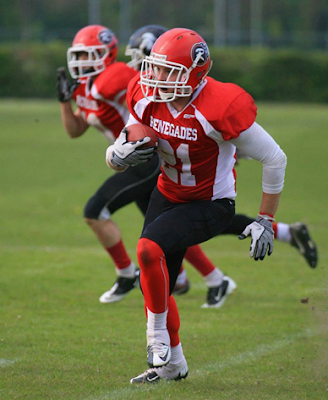 The Berkshire Renegades held their first home game of the 2013 season against rivals East Kent Mavericks. 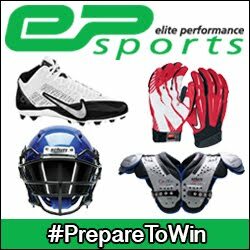 With better conditions for the game than the season opener against Bristol, the Renegades were looking for the first win of the season and to find that first win against the Canterbury side. Opting to put the Renegades defense on the field first, the Berkshire side kicked-off and the defense immediately responded with Rory Buckley forcing a fumble on the Mavericks first possession and veteran Neal Kent coming up with the ball. Despite a penalty marred drive, the Renegades offense struck first with rookie running back Dan Howland taking the ball in from the 3 yard line, with the point after successful, the home side led 7-0 mid way through the first quarter. With the Mavericks offense back on the field and memories of last year’s two high scoring losses to the Mavericks, the Renegades defense stepped up the tempo and forced the normally potent Mavericks running game to small gains, forcing them to take to the air. Running out of steam and excellent coverage from safety Jamie Kingston gave the Renegades offense the ball inside their half. With either team unable to move the ball, the momentum shifted towards the Mavericks after receiver Josh Smith fumbled the ball after a 7 yard gain leaving the Mavericks offense with 30 yards to score. A sustained drive ended with a 12 yard pass to the end zone to level the score at the start of the 2nd quarter at 7-7. The Renegades offense came back out and put together a 49 yard 10 play drive chewing up half of the second quarter clock before being unable to score and leaving the ball deep in Mavericks territory. The defense stepped up the pressure and forced the Mavericks even deeper into their half before punting the ball away. The Renegades offense resumed on the field before veteran quarterback Paul Waddington broke away on a 33 yard touchdown run. With the extra point successful, the home team once again stepped into the lead 14-7. The following drive from the Mavericks was a short affair and the Renegades worked to drive down the field again before fumbling the ball away around midfield. With time expiring in the half the home team held a slim lead. Taking the option to field the ball the Renegades offense came on to the field firing, driving to the 8 yard line before a number of penalties pushed the home team out of scoring range. Neither team’s offense was able to adjust and put points on the board throughout the 3rd and 4th quarters as they traded punts and field position with neither side making much headway. With time expiring in the 4th quarter the visiting side were backed up to their 14 yard line and managed to pull out a long run to midfield. The following two passes were incomplete and a midfield run was stopped short of the 1st down before the Mavericks ripped off a 38 yard pass to put the Mavericks in range of a score. With seconds left on the clock the Mavericks had one final chance to get in the end zone and an 11 yard pass brought them to 14-13. On the last play of the game the Mavericks managed to run in a 2 point conversion sealing the game for the visiting side. Berkshire Renegades 14 – 15 East Kent Mavericks. Proceeds from the big game will go towards the Robbie the Robot Charity.